More than 150 years ago, the British government made smallpox vaccination compulsory, resulting in a massive political backlash. Opponents used tactics and arguments that are familiar today. If anything, the contemporary anti-vaxxer has regressed even further. 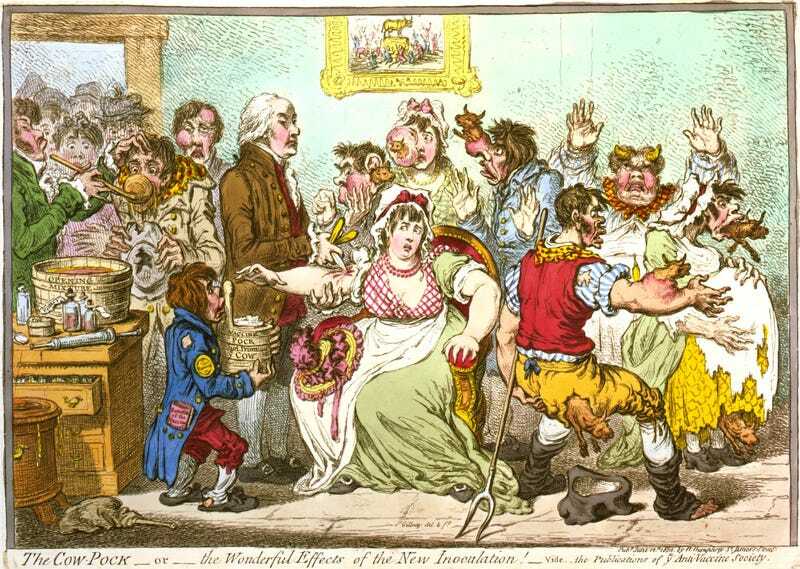 Widespread vaccination had begun in the early 1800s, after Edward Jenner presented his findings to the Royal Society of London in 1796, detailing his success in preventing smallpox by inoculation with infectious material. The Vaccination Act of 1853 made vaccination compulsory for all infants — parents who refused could face stiff fines and even imprisonment. Widespread resistance began almost immediately, with violent riots in several towns — some of which didn't even enforce the law. A group called the Anti-Compulsory Vaccination League was formed, publishing journals and pamphlets about the dangers of vaccination. We fear it is not possible for any argument or any form of suasion to stay the tide of folly and ignorance which is now raging against one the most beneficent discoveries ever permitted to man. The chief actors in the anti-vaccination movement are men upon whom all statements of fact and argument would be wasted. The platform spouters on this question are beyond our hope, and almost beyond our pity. They must be left to hug their darling folly; but for their deluded followers we do feel real commiseration. The arguments which the agitators so boldly state are very specious; they refer to matters concerning which their hearers have no real experience; and they seem to be supported by a certain class of facts. Numerous excellent pamphlets and tracts have been published, with the hope of enlightening the public mind. It is most unfair to those who have readily adopted the chance of immunity which vaccination gives, that they should be exposed to risk on account of their less careful or crotchety neighbours. If the immunity were absolute and life-long, we might perhaps afford to let the foolish part of the community do as it likes; but, unfortunately, such is not the case. Medical literature from the period recounts the numerous ways that activists manipulated facts to make their case. In 1878, the Anti-Compulsory Vaccination League released mortality statistics from the Franco-Prussian War of 1870, which claimed to show extensive smallpox fatalities among the French and German armies, where troops were required to be vaccinated. "These ﬁgures," the League declared, ought to induce every one "to promote a measure for the speedy and entire repeal of the unjust and cruel Vaccination Acts." The statistics, however, were highly misleading in that they combined the smallpox fatalities among soldiers with those of civilians, who were not as widely vaccinated. As one medical expert wrote, as a result of vaccinations, "In the German army, the mortality from smallpox always remained relatively small; the aggregate presenting a ratio of 0.3 per thousand of troops." Likewise, another anti-vaxxer study claimed that smallpox casualties in London had nearly doubled since mandatory vaccination. But the figures had been inflated by population growth and one particularly nasty outbreak. The mortality rate had actually declined by 22% during that period. Other anti-vaxxer tactics included horror stories of children who broke out in horrible, fatal sores immediately after vaccination; activists who went door-to-door volunteering to pay the fines for noncompliance; and courtroom theatrics. The anti-vaccinators have hit upon a notable scheme for defeating prosecutions for breaches of the Vaccination Act. About twenty persons were summoned somedays ago and they were defended by Mr. Gibson Ward, a gentleman who has recently come to be well known in connection with vegetarianism. He addressed the Court for over an hour on the evils of vaccination ; he was repeatedly asked to close by the Bench, but still the stream of eloquence ﬂowed on; and, in the end, the case: had to be adjourned until a future day. Thus Mr. Ward was silenced for the time; but may he not go back another day, and thus keep the magistrates going on adjourning? The local magistrates have an ugly prospect before them. It is quite evident that the introduction of putrescent matter from one body into another produces very serious derangement to health, even in the most successful cases. We know, however, that a very large number of children inherit, or are brought under the influence of, serious diseases. As the tendency of disease is to concentrate itself in eruptive matter, the insertion of the vaccine virus, as it is called, is not a simple process of introducing a specific contagion into the blood and tissues of a child, but it may be a complicated and highly deleterious compound which is introduced into the system, and so the seeds of worse diseases than small-pox may be sown in the svstem. Empirical treatment ought not to be made compulsory; and the law exceeds its prerogative when it compels the running of such fearful risks as are often involved in the blood-poisoning induced in vaccination. But another key issue driving the debate was the issue of individual rights versus the obligations of citizens to safeguard public health. This period represented two clashing developments. On the one hand, advances in scientific research had shown the importance of preventing outbreaks through widespread immunization campaigns. However, it was also a period when British citizens were gaining more political rights, and they saw mandatory vaccinations as evidence that their government was seeking to take those rights away. We have shown that in the universality of the practice [of vaccination] lies the only safety of the public. It is one of those matters in which private judgment, or, rather, private want of judgment, cannot be allowed to interfere with the grand result which is before us. It is one of those in which, to use the words of Mr. Mill—the most ardent exponent of the principle of individual liberty—"there is an evident justification for converting the moral obligation into legal one; just as, in many other cases of the progress of opinion, the law ends by enforcing against recalcitrant minorities obligations, which to be useful must be general, and which, from a sense of their utility, a large majority have voluntarily consented to take upon themselves." Men must not be allowed to plead their conscientious objections to using preventive measures on their children, in order that they may have the privilege of inflicting the pain and death of an epidemic upon the children of others in their neighbourhood. What sort of a conscience clause would satisfy the person who virtually avers, "I conscientiously object to the endurance of a small amount of suffering and of a slight risk by my child; but I do not object to my child's becoming a great risk to the neighbourhood in which I reside, as a centre of infection, and the cause of great suffering, by the spread of infection to many of the children of my neighbours"? Eventually, however, Parliament did succumb to public pressure. A new Vaccination Act in 1898 introduced a conscience clause, allowing parents who didn't believe that vaccinations were safe to obtain a certificate of exemption. This legislation would have a lasting impact beyond the issue of vaccinations. It introduced the concept of the "conscientious objector" into English law. And there is one key distinction between the anti-vaxxers then and those today. Although the British protesters were self-deluded, many of them were also social activists who believed in the obligations of society to safeguard public health. As one historian has noted: "The emphasis on preventive methods that focused on individual bodies rather than on environmental conditions, anti-vaccinators feared, undermined efforts to achieve large-scale sanitary improvements that they claimed were the only way to address the problem of urban poverty, the root of epidemic disease." Today, parents who refuse to vaccinate their children can't be bothered to think about the well-being of their communities. In that regard, the anti-vaxxers are not merely stuck in history — they're moving us even further backwards.